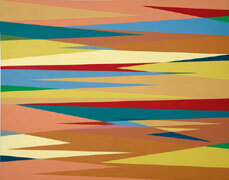 Michael Stevenson is pleased to present Odili Donald Odita's first solo exhibition in South Africa. Odita's work was initially shown at the gallery on Distant Relatives/Relative Distance (2006), an exhibition of work by contemporary African artists living elsewhere in the world, and which travelled to the Standard Bank Gallery in Johannesburg. 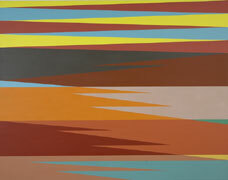 Over the past two years, Odita has expanded his painting practice to include temporary mural installations. Moving beyond the constraints of the canvas has allowed him to explore the relation of painting to space, architecture and three-dimensionality. In addition, the ephemeral nature of these works pushes them into the realm of performance and situations, an area not traditionally associated with the painting medium. 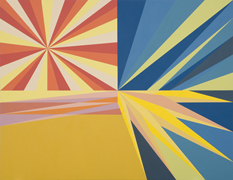 Double Edge, Odita's show at Michael Stevenson, will comprise a suite of paintings informed by the mural process and related concerns. 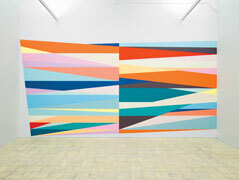 In addition, Odita will create a site-specific wall painting at the gallery. 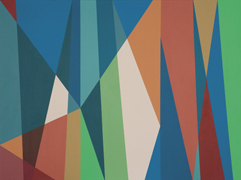 For Odita, colour and form represent the brief moment before concepts are applied in the form of language, like the multicolored flash that precedes the image on old television sets. At a time when people habitually mistrust intuition and visual pleasure, his work relies heavily on both. While intuitive responses to colour are important, however, Odita is equally interested in the way colours have become cultural codes and have gained associations of ethnicity and geography. The title, Double Edge, speaks to these twinned concerns of form and culture. 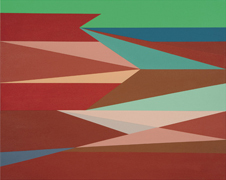 Odita's interest in colour is as much an engagement with the history of colour theory as it is a reflection of his interest in global trade routes. At the time when pigments were still based on natural commodities, trade centres such as the Netherlands were at the epicentre of colour experimentation. 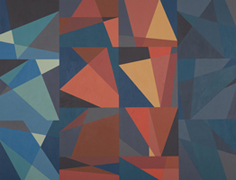 Odita's dialogue with modernist ideas about form is similarly double-edged, also reflecting his belief in contemporaneous internationalist ideals. And now, through the extension of his practice to murals, his ideas about painting have become, equally, ideas about architecture. 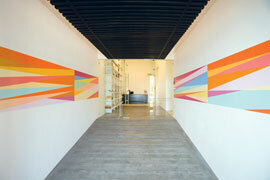 Odita's most recent site-specific mural was commissioned for the Ramp Project at the Institute of Contemporary Art, Philadelphia (opening 5 September 2008). 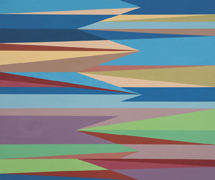 He inaugurated the Project Space at the Studio Museum in Harlem, New York, with Equalizer (2007-2008), a mural he describes as a 'conceptual journey' related to two episodes of migration from the African continent to the Americas. 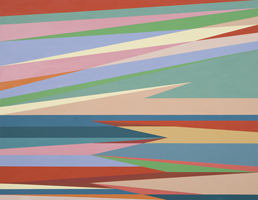 Other recent commissions are Flow (2007-2008), a wall painting for the lobby of the new Contemporary Art Center Cincinnati, designed by acclaimed architect Zaha Hadid, and Give Me Shelter at the 2007 Venice Biennale. 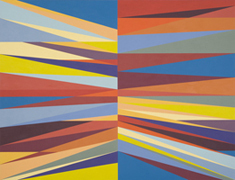 Odita has upcoming shows in the Project Series at the Ulrich Museum at Wichita State University (opening January 2009), and at the Velan Center for Contemporary Art in Turin, Italy, in May 2009. Born in Enugu, Nigeria, in 1966, Odita lives and works in Philadelphia and New York. He is an Associate Professor of Fine Art at Tyler School of Art, Temple University, Philadelphia. Odita will exhibit concurrently with Anton Kannemeyer. The exhibition will open on Thursday 16 October, 6 - 8pm. Odita will give a free public walkabout of his exhibition on Friday 17 October at 11am; all are welcome. The gallery is open from Monday to Friday, 9am to 5pm, and Saturday from 10am to 1pm. © 2008 Michael Stevenson. All rights reserved.